Although considered a modern comics classic that’s delighted millions of readers all over the world, Jeff Smith’s multi-volume epic Bone is also one of the most commonly challenged series in American libraries and schools. According to ALA’s Office for Intellectual Freedom, the books have faced several challenges and at least one ban over the years. In hopes of preventing any future bans of the Bone series, we’ve put together these resources for librarians and educators who may need to justify and defend the inclusion of the book in library and classroom collections or curricula. Every good epic not only deserves but needs a prequel. So Jeff Smith’s Bone, one of the great graphic novel epics, gets a teasing look at what happened in that magic realm before the series started in earnest. Opening with a Nordic sagalike origin myth about how the dragon queen Mim was driven mad by the lord of the Locusts and buried in stone to protect the world, Rose shifts into a traditional fantasy melodrama about two princesses. Rose is the more beloved, headstrong and inattentive to her lessons about how to control her powerful ability to magically dream. Her sister, Briar, is a darker soul, ambitious and resentful of the attention directed at Rose. When the two are called to their final tests in the danger-fogged mountains of the Northern Valley, they are soon launched into a fiery cauldron of betrayal and batties–all of it witnessed by the dolorous, mournful eyes of the Great Red Dragon. Vess’s dramatic, detailed illustrations remain powerful, but feel cramped by the small trim size. Smith’s tart writing easily weaves humor and tension into a tale packed with lessons on politics and morality. Gr 4-8–A prequel to the “Bone” saga (Scholastic), Rose takes place in the Valley years before the Bones arrived, when Gran’ma Ben was the spirited, beautiful Princess Rose. She and her cold, bitter sister, Briar, are called to defend the Valley from a vicious dragon that is possessed by the Lord of the Locusts. Rose is up to the task, but can Briar be trusted? Vess’s Art Nouveau-style illustrations, as well as an elegant, ornate font, give the story the look of an antique fairy tale. The vivid but soft colors, in subtle shades of red, yellow, green, and blue, are stunning. A strong introduction for readers new to the series, and a satisfying addition for fans hungry for more. The greatest story Disney never told, this first entry in the “Bone” series is inspired by a half-century of comic strips, comic books, and animation. Bone, a sort of hairless Pogo, is a good-hearted creature, lost in a (not-entirely) inhospitable fantasy world of maidens, dragons, and racing cows. With amazing comic timing and deftness of line, Smith brings his characters to brilliant, black-and-white life. The nine-volume Bone graphic novel series was the toast of the comics world when it was published by Smith’s own Cartoon Books beginning in the early 1990s; in this first volume of Scholastic’s new edition, the original b&w art has been beautifully converted into color. Smith’s epic concerns three blobby creatures who have stumbled into a valley full of monsters, magic, farmers, an exiled princess and a huge, cynical dragon. The story is something like a Chuck Jones version of The Lord of the Rings : hilarious and action-packed, but rarely losing track of its darker subtext about power and evil. This volume is the most lighthearted of the bunch, though, featuring some of the wittiest writing of any children’s literature in recent memory–a few of Smith’s gags are so delicious that he repeated them for the rest of the series. It also introduces the Bone cast’s unforgettable supporting characters: the leathery, tough-as-nails, racing-cow-breeding Gran’ma Ben; the carnivorous but quiche-loving “rat creatures”; a spunky trio of baby opossums; and Ted the Bug, whose minimalist appearance (a tiny semicircle) exemplifies Smith’s gift for less-is-more cartooning. The way his clear-lined, exaggerated characters contrast with their subtle, detailed backgrounds is a product of his background in animation, and so is his mastery of camera angles and choreography. This is first-class kid lit: exciting, funny, scary and resonant enough that it will stick with readers for a long time. Grade 4 Up–The strange-looking Bone cousins visit Barrelhaven with their friends Thorn and Granma Ben. Phoney Bone, who usually causes trouble, does so again in these six chapters. He tries to swindle the villagers by fixing the annual Great Cow Race. While the race is underway, Fone Bone, who has wandered off to the woods, is chased by two giant rat creatures that have been after the Bones since their arrival in the valley, but they dont know why. Granma Ben knows something, though, and makes ominous references to a past war with the rat creatures and a treaty that is being tested. In addition to the comic elements, there are the usual fantasy elements of the fight between good and evil. Exciting and fun, the full-color art moves the story along at a rapid pace. The vocabulary is not difficult and the illustrations are clear. On one level, the book will appeal to fourth or fifth graders. However, it has a darker side that will appeal to teens. The writing flows gracefully, especially for a graphic novel. This book will be well received in both public and school libraries. On the cover of Eyes of the Storm, a scene is set: Fone is surprised and frightened, Thorn casts a wary glance behind her, rain is starting to fall, and the red-eyed evil rat creatures glower at them through a dark forest. Trouble must be brewing: Gran’ma Ben is rolling up her sleeves in anticipation of yet another fight with dark forces. Of the three “Bone” books published by Scholastic thus far, Eyes of the Storm is definitely the darkest. During the second “Bone” book, Great Cow Race, the rat creatures attacked and damaged the farmhouse in which Gran’ma, Fone, and Thorn have been living. It is clear now that Thorn is in danger, and the dreams which have troubled her before become increasingly more vivid and threatening. Chapter 5 of Eyes of the Storm brings yet another attack by the rat creatures, and, after the Red Dragon reappears and frightens the rat creatures away, Fone and Thorn decide that it’s time to show Gran’ma Ben the map that Fone has been carrying around. Finally, long-kept mysteries are explained. As an astute reader might have guessed, Thorn is a princess in hiding. She is the daughter of the King and Queen of Atheia, a valley kingdom which was bordered by mountains in the east (the mountains controlled by the rat creatures) and a western region (inhabited by the dragons). Gran’ma Ben painfully retells the story of the deaths of her daughter and son-in-law, and, as she recounts family history, we see her again as the warrior queen of past. She is dedicated to protecting her granddaughter, Thorn Harvestar, and knows that conflict with the rat creatures is inevitable because the Lord of the Locusts is back. Despite the threats, there are light moments as well. As usual, Phoney is scheming. Working at The Barrel Haven, the local tavern, Phoney is attempting to pay off gambling losses sustained from his attempt to “fix” the outcome of the Great Cow Race. Once again, Phoney finds himself in imminent danger from a wrathful mob – this time, it’s the patrons of the Barrel Haven – and once again, he saves his skin, this time by setting himself up as a “professional dragon-slayer.” With all that threatens, courage and fighting skills will be in demand. Readers of the first two volumes of Scholastic’s serialization of the “Bone” series will be happy to continue the story, which is once again, rendered in full colour. At this point, those who haven’t read volumes 1 and 2 might have a bit of difficulty picking up the threads of the story as Eyes of the Storm is less of a stand-alone volume than its predecessors. If you haven’t bought the first two volumes of the “Bone” series, it’s time! Eyes of the Storm will appeal to readers of all ages, both sexes, and every level of reading motivation. Read it and enjoy! This is the penultimate chapter in one of the most widely acclaimed graphic novel series in the United States. It’s the story of the three Bone cousins–good-hearted Fone Bone, avaricious Phoney Bone, and dopey Smiley Bone. Driven from their home, they become allies of the people of the valley in their struggle against the invading Rat Creatures and the Hooded One. In this volume, the Bones, along with Gran’ma Ben (a.k.a. Rose, the land’s queen, returning from exile) and her granddaughter Thorn, enter the city of Atheia, where Gran’ma reunites with old allies and faces danger from a usurper while Phoney Bone schemes to take charge of the city’s treasury. Meanwhile, the army of the Hooded One is advancing on the city, and the stage is set for the final battle. Adventure, comedy, imagination, and clean, accomplished artwork–bringing to mind such masters as Carl Barks, Walt Kelly, and Hayao Miyazaki–come together to produce a classic with wide appeal for readers ages ten to 100. Most libraries will want the sturdier hardcover editions, because these books will be checked out repeatedly. Winner of 17 Eisner and Harvey awards and many other awards besides, this is a series no library should be without. In this ninth and final volume of Smith’s award-winning Bone series, Thorn and her loyal friends must defeat not only the evil Briar Rose but also free the land and its inhabitants from the Locust spirit. Beaten by tyrant Tarsil’s soldiers, Thorn and faithful Fone Bone are locked in the dungeon, as Briar Rose and her army storm the castle. Spurred on by a recurring dream, Thorn is determined to break free and find the Crown of Horns, which will destroy the nightmare spirit known as the Locust but may also kill Thorn herself. The Locust was imprisoned within the legendary dragon queen Mim, whose body was encased in stone but who now threatens to break free. With the help of Gran’ma Ben and Fone Bone’s cousins, Smiley and Phoney, Thorn is able to escape and make her way to Tanen Gard, the dragon burial ground, where she hopes to find the Crown of Horns. Smith expertly combines all the best elements of fantasy epics like Lord of the Rings–a plucky hero(ine), all manner of creatures and a kingdom rich in mythological history–with enough humor to appeal to readers young and old. The colorization effort of Smith’s epic comic Bone reaches its culmination with this final volume in the nine-book series. There really aren’t any superlatives left to lay at Smith’s feet for his timeless achievement, but now that the entire work is available in gorgeously rendered color, it is an even more attractive offering. The story concludes Fone Bone’s saga in the Valley with a full-scale battle and a touching farewell to his friends Thorn and Gran’ma Ben. There may be a few purists who will liken this to Ted Turner colorizing classic films or George Lucas’ digital fiddling with the Star Wars franchise, but they’ll be a tiny minority. Even though the black-and-white artwork of the originals was spectacular in its own right, the color versions offer so much more to look at in every panel, bringing many of the details that might have gone unnoticed to the forefront without losing any of the subtlety of Smith’s impeccable line work and juxtapositions of humor and drama. A masterful rendering now fully ready for a whole new generation of readers. Grades 6-12. Now that Scholastic has completed its colorization of the entire Bone series, including the prequel, Rose (2009), fans get this little collection of bite-size morsels to savor as they await with bated breath the first book in a new Bone trilogy due out this fall. A couple of new stories lead into the centerpiece, which was first published as Stupid Stupid Rat-Tails by Smith’s Cartoon Books in 1999. This yarn follows the legendary founder of Boneville, Big Johnson Bone, and his adventures in the Valley, where rat creatures are threatening the cuddly forest denizens. The stern-jawed, brawl-ready Big Johnson doesn’t quite have the lasting personality of Fone, Phoney, or Smiley, but his hilariously offhanded heroics and nearly delusional coolheadedness in the face of danger (“This reminds me of the time I was nearly consumed by the voracious Hungrisaur! There I was, buck naked . . .” he says as he is swallowed by an enormous rat creature) make for unswervingly entertaining reading. Pretty much an essential purchase for collections that house Bone, which should be all of them. Gr 4-8-This installment introduces Big Johnson Bone, the explorer who founded Boneville. A fearless Davey Crockett-like character, he defeats a cave bear when just a baby and grows up to best all manner of beasts, including a pack of ratlike creatures intent on taking over the forest. Big Johnson’s recklessness in the face of danger results in much humor, as does the commentary of his terrified, sarcastic monkey companion. Smith’s quick wit shines through in the exchanges between Johnson and his companions. The colorful art is jam-packed with action, and the characters are enhanced with exaggerated features and movements. The story moves quickly as Big Johnson falls into one predicament after another. This addition to the “Bone” saga will keep readers of the series happy and create new fans. Now that Jeff Smith’s Bone series is drawing to a close, it’s clear that it is a true accomplishment. Not only is it a terrific graphic-novel series, but it’s a superb example of storytelling. During the past 12 years, Bone has been translated into 15 languages and has become a staple in many library collections. It has also received numerous national and international awards. I recommend it for students in grades three and up. Smith uses a straight-ahead drawing style to convey a range of personalities, philosophies, and emotions. The series features the three Bone cousins-good-hearted Fone, scheming but loyal Phoney, and carefree Smiley-who escape an angry mob in their native city of Boneville and wind up in an unmapped part of the world. The series follows the fortunes of a dethroned royal family whose hope of reclaiming their kingdom rests on a teenager who doesn’t know that she’s the royal heir. Through his consummate skill, Smith convinces us that the comical Bone cousins are critical to the royal family’s quest. The series’ first three novels, Out from Boneville, The Great Cow Race, and Eyes of the Storm, firmly establish the Tolkien-influenced world that the Bones are stranded in and display Smith’s humor. The next three books, The Dragonslayer, Rock Jaw Master of the Eastern Border, and Old Man’s Cave, solidify Smith’s reputation as a dramatic storyteller. And the two most recent titles, Ghost Circles and Treasure Hunters, take the reader up to the final battle for control of the valley. The final book, Crown of Thorns, will be published by Cartoon Books early next year. Mere months after publishing the final installment of the long-running fantasy saga Bone, Smith collects all 13 years’ worth of it in a single, massive volume. As many comics fans know, the series chronicles the adventures of the Bone cousins—plucky Fone Bone, scheming Phony Bone, and easygoing Smiley Bone—who leave their home of Boneville and are swept up in a Tolkienesque epic of royalty, dragons, and unspeakable evil forces out to conquer humankind. The compilation makes it evident how fully formed Smith’s vision was from the very beginning—although the early chapters emphasized comedy, as do the final pages, the tale quickly found its dramatic bearings. His remarkably accomplished drawing style, in the manner of such comics masters as Walt Kelly and Carl Barks, was fully formed from the start, too. Libraries that have missed out on individual Bone series titles should seize this opportunity to make up for the fact, and those who have collected the series all along will do well to acquire the collected edition to supplement or supplant those doubtless well-worn volumes. But be prepared for overdues: even the most voracious readers will be hard-pressed to get through this hefty, phone book–like tome before they’re supposed to return it. 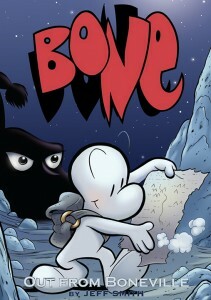 Cartoon Books, the publisher of Jeff Smith’s award-winning fantasy series, Bone, has done it again. 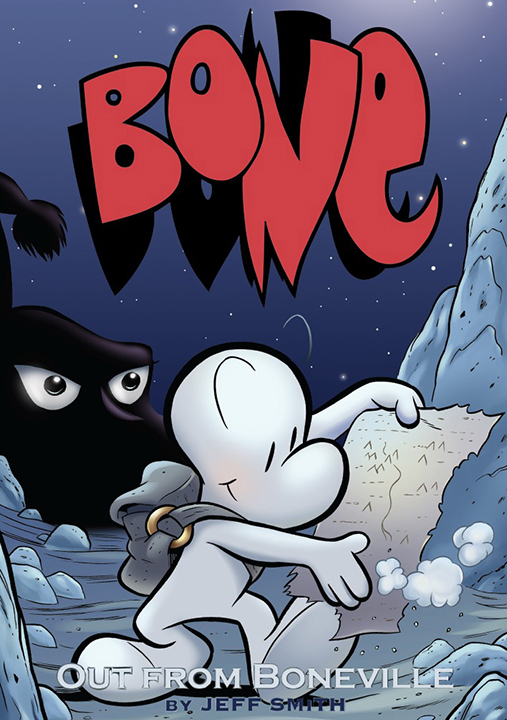 Bone was originally published as a series of separate black-and-white graphic novels, but Smith went back and smoothed out the small inconsistencies in the stories and Cartoon Books has released the entire saga as Bone: One Volume Edition. Arguably the longest graphic novel ever written (1,343 pages), the one-volume edition stands alongside other first-rate fantasies, such as Tolkien’s The Lord of the Rings and Neil Gaiman’s Sandman, not only for its ample heft but because it stretches the traditional fantasy story by adding original characters, humor, pathos, adventure, and drama. What’s Bone’s biggest drawback? It’s too bulky to read on the subway and fit into your pocket. Gr 3 and up. As graphic novels have faced various challenges and censorship attempts, CBLDF has put together a series of Case Studies that help to explain more about a particular title or series and the specific challenges that they faced. Much like the CBLDF Discussion Guides, the Case Studies can be used as a tool by librarians, educators, and retailers to understand more about the obstacles that certain books have had to overcome to lead more informed and dynamic discussions. You can read the Case Study for Bone here. What should I do if Bone is challenged?